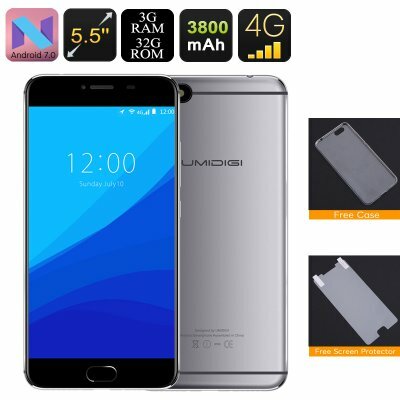 Successfully Added UMIDigi C Note Android Smartphone - Quad-Core CPU, 3GB RAM, Dual-IMEI, 4G, Android 7.0, 13MP Cam (Gray) to your Shopping Cart. If you are looking for an affordable Android smartphone that comes packed with powerful hardware and the latest software features, the UIMIDigi C Note is there to answer all your demands. Running on an Android 7.0 operating system, this Android phone provides you with the latest software features available on the market. Additionally, it gives you free access to the Google Play Store through which you will be able to download millions Android applications, games, and other forms of mobile entertainment for free. With its massive 3800mAh battery, you’ll be able to enjoy all the phone’s features for up to 20 hours in a row. Under its hood, this sleek Android phone packs a Quad-Core processor from MediaTek that reaches speeds up to 1.5GHz. Along with 3GB of RAM, this CPU delivers a powerful yet energy efficient performance that lets you enjoy the most demanding of games and applications. Thanks to the mobile phone’s stunning 5.5-Inch SHARP display, you can now watch your favorite movies, series, and play games anywhere you are. Supporting crisp 1080p resolution, this Android phone brings forth great detail and vivid color – truly letting you take the most out of your smartphone experience. Staying connected to friends and family has never been easier as this Android phone supports both 4G and Dual-Band WiFi. Whether you’re at home or outside, from now on you’ll always be able to browse the web and check your social media notifications to ensure you’ll never miss an important update again. It furthermore comes with two SIM car slots and supports Dual-IMEI numbers, brining along great efficiency for those that like to be reachable on two phone number while using merely one device. With a stunning 256GB of external memory support, this Android smartphone holds plenty of space to store your media, files, and pictures. The latter can be snapped with your phone’s amazing 13MP rear camera that lets you take breathtaking photographs and shoot mesmerizing video in FHD resolution. Along with its camera, the mobile phone also features a state of the art fingerprint scanner that lets you unlock your phone and access your files in just 0.1 second. This features brings along high efficiency and great security for all smartphone users out there.